Well hello there! I feel like I haven't seen you all in ages...probably because we have been vacationing for a month. Yes one ENTIRE month-long road trip. It's been epic. And now I'm faced with reality and responsibilities and chores and real life and half-finished stairs. Ugh. Plus an epic amount of photos to go through. So. In the meantime and until I can come to grips with normal life, I stumbled upon a photo that you might enjoy. 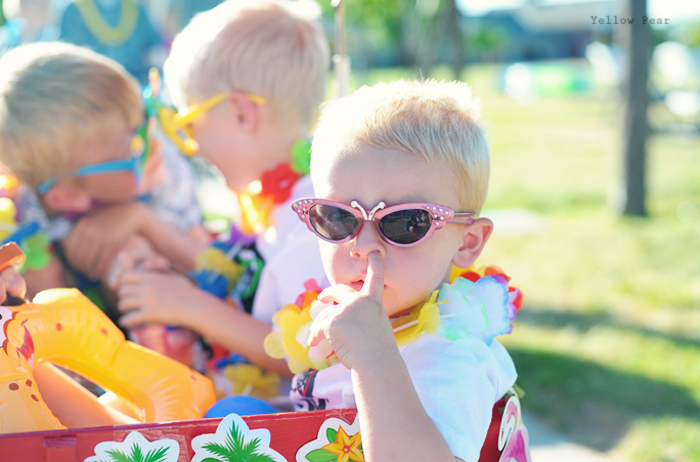 It is of my cute nephew (with his brother and Dennis in the background) getting ready for a Luau-themed parade recently. I think it quite the masterpiece of perfect timing and stylish shades. Anyway I hope your summer is just plain awesomeness and that you have some butterfly sunglasses to enjoy it with. Toodles. I am off to sift through the enormity of returning into the mainstream "real world". Never easy.